The Church of the Nativity, Bethlehem. 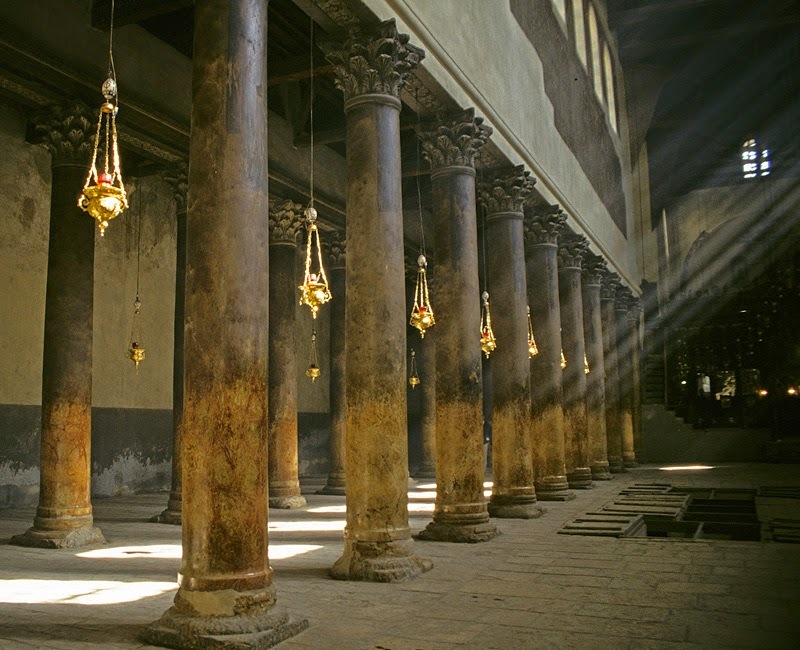 The first Church of the Nativity in Bethlehem was founded by the Emperor Constantine on the site held to be the birthplace of our Saviour and consecrated in 339AD. Only two hundred years later it was replaced by the present church, founded by the Emperor Justinian in 530AD. An overview of the history of this venerable site can be found here. a solid masonry wall was in place, completing obscuring the presbyterium. This church is in the basilican style - a style based on a form of public building found in ancient Rome from the early first century AD. Constantine adopted the style of these buildings for Christian churches. 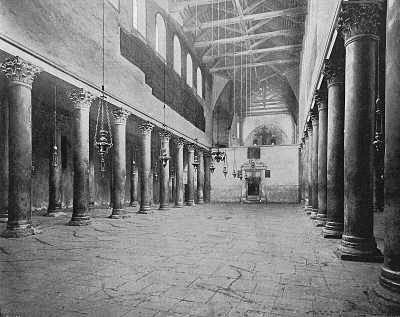 Churches are still being constructed in this form today : a wide nave, with arcades of columns separating the nave from aisles. In the case of this church, there are two aisles on either side of the nave. 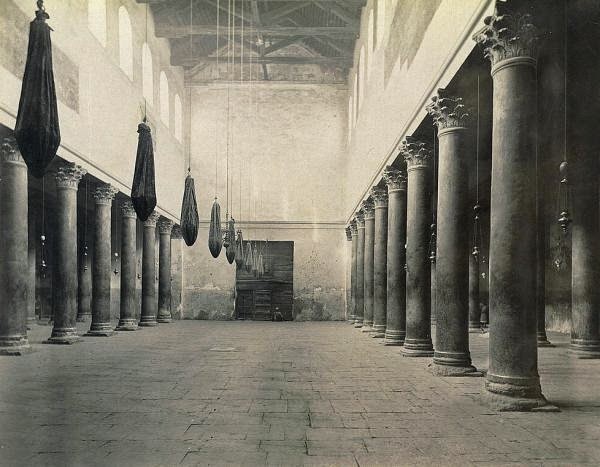 Another 19th century view of the nave, looking towards the entrance. One of the most notable features of a basilica is the clerestory, the solid upper wall of the nave, often piereced with windows, throwing much natural light into the nave, but less so into the aisles. Fragments remain in the Church of the Nativity of a frescoes painted on the clerestory walls. 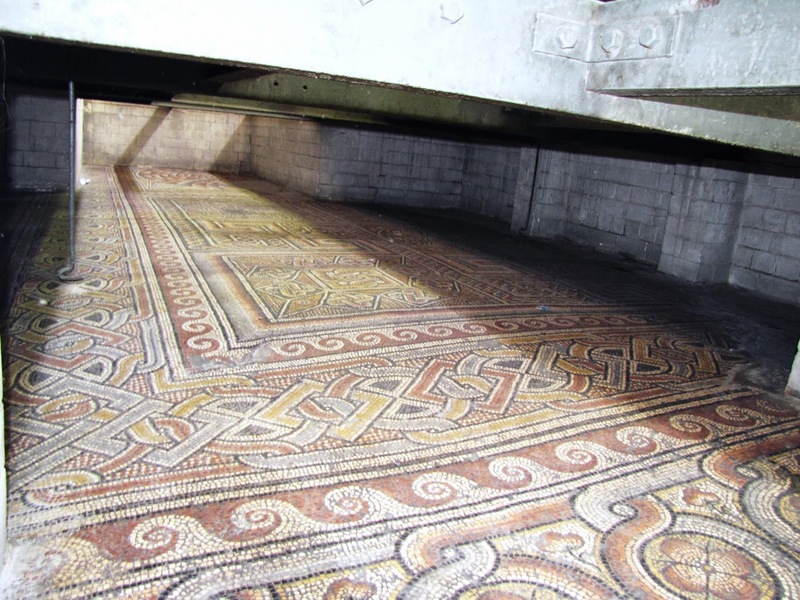 Beneath the floor of the present building, sections of the mosaic floor of the earlier church remain intact. The progression of columns draws the eye toward the focal point of the building, its head. Beyond the nave in a basilican style church was located the presbyterium or sanctuary, either rectangular in shape or semi-circular (an apse). One of the peculiarities of the Church of the Nativity, however, is that the presbyterium is obscured by an iconostasis, constructed by the Greek Orthodox, whose monastery is adjacent to the Church. This elaborate screen is relatively late in the history of the building; beyond it lies the High altar. It is difficult to gain an impression of what the presbyterium (with its high altar) would originally have looked like before a screen existed. 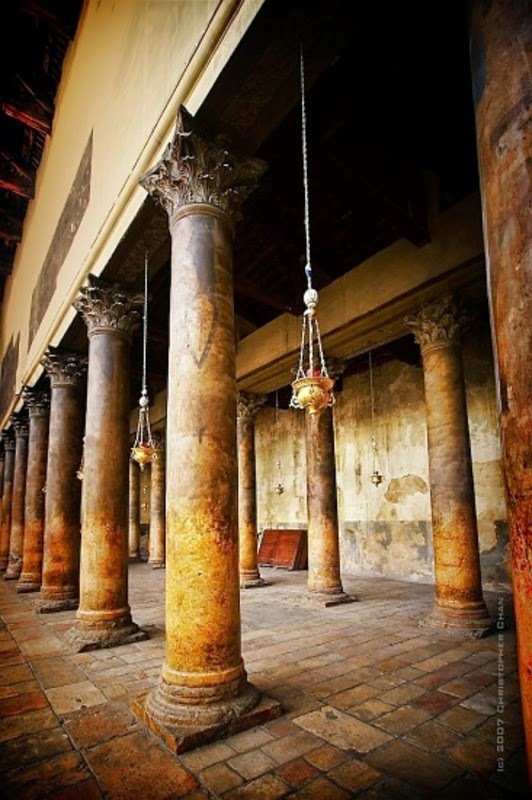 Glorious columns of Emperor Justinian's nave.